New Chelsea manager Maurizio Sarri has his work cut out trying to mold the Blues into a bona fide contender after taking the reins from Antonio Conte. The Premier League roars back into action on Friday after another frenetic summer of transfer spending in the world's richest soccer league. Champion Manchester City is favored to become the first side in a decade to retain the title, but hopes are high that Liverpool can end a near three-decade wait to win the league. Chaotic offseasons for Manchester United and Chelsea could undermine their challenge, while there is an air of optimism for a new era at Arsenal. Manchester United manager Jose Mourinho has cut a frustrated figure throughout the preseason, consistently lashing out at a lack of signings. Tension between the Portuguese boss and a number of key players is also simmering. Mourinho has publicly criticized captain Antonio Valencia and Anthony Martial, while his relationship with Paul Pogba remains frosty after dropping one of the heroes of France's World Cup win repeatedly last season. Rising tension with the club's hierarchy before the season even begins is eerily reminiscent of Mourinho's disastrous third seasons in both his second spell at Chelsea and his stint with Real Madrid. In those campaigns Mourinho lost his job after winning the league the season before. At United he isn't even starting from that position of strength, having failed to win a trophy last year. As fiercest rivals City and Liverpool strengthen for an anticipated shootout for the title, the ingredients are in place for another Mourinho meltdown at Old Trafford. Champion City remains the team to beat after smashing a litany of records in romping to the title. Unlike Pep Guardiola's first two summers in charge, City hasn't blown the competition out of the water financially, although it has increased its attacking options with Riyad Mahrez for a club-record $77 million fee. But it hasn't needed to do more after assembling a huge amount of talented young players in recent years. Even more will be expected of the likes of Bernardo Silva and Gabriel Jesus this season, while Benjamin Mendy's return from a long-term knee injury solves City's one issue last season at leftback. Chelsea is playing catch-up after delaying its move to fire Antonio Conte and hire Maurizio Sarri until four weeks before the start of the season. Sarri molded Napoli into one of the most attractive sides to watch in Europe in three seasons, earning rave reviews from City boss Guardiola in particular. However, his high pressing and slick passing style requires a lot of work on the training ground. With many of Chelsea's key players only returning to training this week after their World Cup exertions, the Italian hasn't been afforded much time to impose his ideas. Chelsea's lack of forward planning was also evident in a late rush for a replacement for goalkeeper Thibaut Courtois, who left for Real Madrid on Wednesday. The giant Belgian's successor, Kepa Arrizabalaga, will be the most expensive goalkeeper ever once he completes a $92-million move from Athletic Bilbao. Sarri should be able to call upon Eden Hazard, Willian and N'Golo Kante despite speculation over their futures at Stamford Bridge. In contrast, Unai Emery was swiftly sworn in as Arsene Wenger's successor with the Gunners and has clearly targeted building from the back as his first priority. The recruitment of goalkeeper Bernd Leno, experienced defenders Sokratis Papastathopoulos and Stephan Lichtsteiner and tough-tackling Uruguayan midfielder Lucas Torreira should provide a stiffer backbone. There is also plenty to be excited about with Pierre-Emerick Aubameyang, Henrikh Mkhitaryan, Mesut Ozil and Alexandre Lacazette united for a full season. 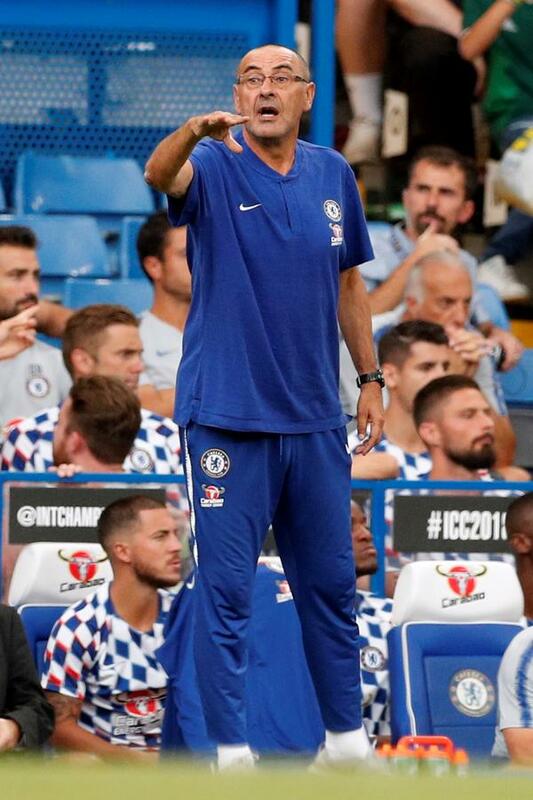 Emery has been handed a baptism of fire with City and Chelsea in his first two games in charge. However, there is the possibility for a fast start with Arsenal far less affected by late returns to preseason from the World Cup than their competitors in the top six. The ambition for most newly promoted sides is simply to retain their Premier League status, but Wolverhampton Wanderers' and Fulham's moves in the transfer market suggest they are aiming for a top-half finish on their returns to the top flight. Wolves have again utilized their close connections to super agent Jorge Mendes to snap up experienced Portuguese internationals Rui Patricio and Joao Moutinho. Fulham beat stiff competition for Ivorian midfielder Jean Michael Seri and has also spent big on making Aleksandr Mitrovic's loan move from Newcastle permanent and Alfie Mawson, as well as a loan move for experienced German international Andre Schurrle.